You couldn't tell it from today's weather (50 degrees? Are ya kiddin' me??? ), but it is JUNE! And with a new month comes a new Currently from Farley! Listening - at first intermission we are up by 2! Yeah buddy! Loving - 3 hours, 10 minutes of students tomorrow, then SUMMER!!! The adults still have a full day, but we all know that's gravy once the last bus pulls out. Wanting - I've already accomplished most of the packing up, but I want to make sure I get everything wrapped up and locked up. I've spent an unfathomable amount of time getting these rooms the way I want them, I do not want to have to start over! Needing - RECOVERY TIME! 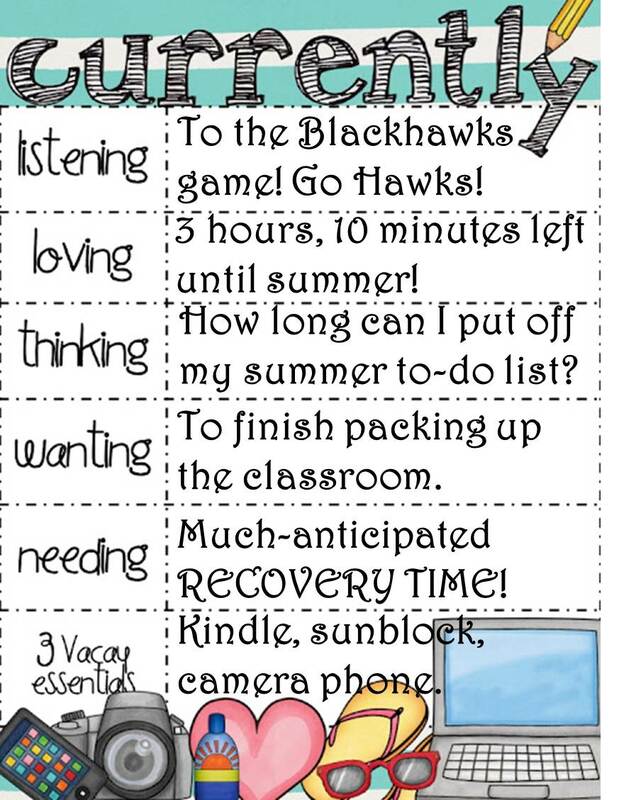 I've always had a good-sized to-do list for summer, and I've always started my timeline the first week school is out. Foolish, foolish girl, as most of the first week is spent in various forms of sleep. This year I'm just admitting that the first week will be more or less dedicated to napping and recovery. Vacay Essentials - First and foremost, my Kindle! SO MUCH TO READ!!! Sunblock, as I burn easily. And of course my phone for all the photos I'll take (which I'll look back at during the tough times next school year). 3 hours, 10 minutes... Bring it on! I am hosting a Monthly Goal linky, hope you stop over and link up! I love your blog! The linky is wonderful for meeting other bloggers! Blackhawks fan?? Tampa Bay Lightning fan here! I DO applaud you for being in the playoffs! Lightning just aren't cuttin' it! I am a first year teacher, and I am wondering if I am going to procrastinate procrastination! I think of all these wonderful ideas, but somehow, I get side tracked! Then at the last minute... I am wondering where all the time went. I am trying the Interactive Notebook in my class next year. Hoping I can get in gear and plan! I love your countdown! I'm down to days- 3 1/2. But I'll be counting the hours by Wednesday. Can't wait for summer!